My amazing coaching client, Amy, texted me yesterday morning asking me for a quick 5 minute call as she was really struggling. I let her know when I was available to chat and I was thankful we were able to have some time together for me to encourage her. Amy's top #1 goal right now is to align how she is walking out her everyday life with her priorities in this current season... which translates into leaving work at work, not taking on new roles or projects outside of work or family, and protecting her time with her husband and children. As soon as I answered the phone, I could tell that Amy was very upset. She began telling me about how the night before one of her kids came home late and when she asked them about it, the kid said "Well, I just figured you would be working so it wouldn't matter what time I came home." This made her feel so discouraged, which was understandable, but I offered her a different perspective. I told her "How awesome was it that you were actually physically THERE to show your husband and children that you are being intentional about making these changes in your life. Even if they are hurt from the past, by you staying consistent in the present, you are showing them that they are a priority to you in the present and the future. Keep to your word and know that they are watching." Most of us have some sort of goal we are trying to reach, even if we haven’t fully formulated the goal in our mind. We want to try something new, break an old habit, be successful at work or at play. Sometimes these goals can be a bit vague in their scope without a defined path toward achieving the goal, a sort of general sense of wanting to be healthier, lower our blood pressure, manage our stress, achieve success at work or at sport, be a better friend, spouse, parent, employer, employee, athlete, student…person. You know, the bigger picture things we want to accomplish. The things we have defined for ourselves as “success”. But sometimes the big picture is so big, we don’t know what steps to take to get us there. The goal can seem overwhelming; we may feel we don’t have the time or the resources or we don’t see what steps we can take to get ourselves there. We don’t know where to start so we make excuses. Or the goal isn’t really ours, it’s something we feel like we should do. It’s not our “why”. Or we don’t start because we think we’ll fail. Oftentimes, this is because we set unrealistic expectations and believe that if we’re not perfect in our pursuit, we’re a failure. But we’re human. We’re imperfect. It’s what makes us each unique... and AMAZING! Perfection should never be the goal because the outcome will always be failure. We focus on the journey, not the destination. 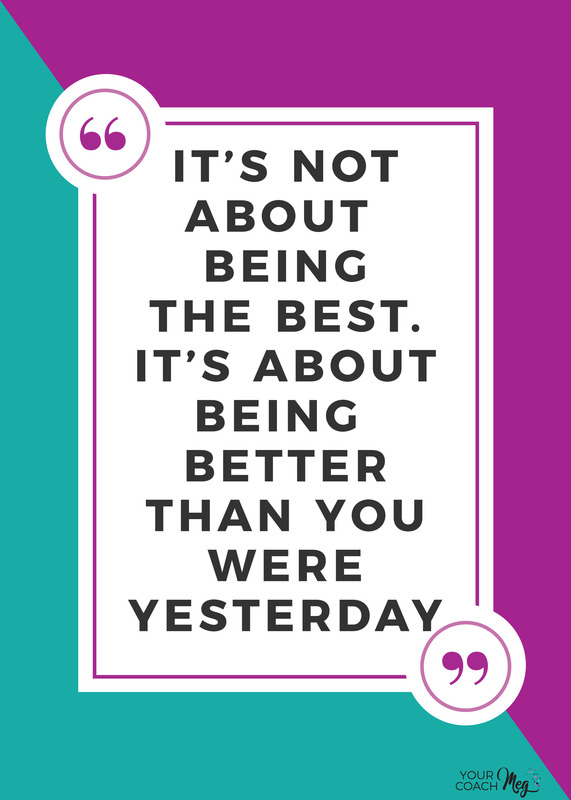 We strive for improvement, learning, growth, understanding. We strive for excellence and awesomeness, but still allow for imperfection. For wiggle room. For the knowledge and comfort that even if we veer off the path for a bit, the path is still within our reach and we’re still heading in the right direction. To truly make a lasting change, it has to be a change that is meaningful to us, not just to others. It can’t be something we feel is imposed upon us rather than chosen by us. It has to be something that we value, that we believe in, that we can get behind and commit to because we know the work will be worth it. We have to ask ourselves why we want to make the change. And we have to be honest with ourselves. It has to be something that is meaningful, that we can call upon when we’re struggling along our journey that will help to keep us on the right path. Something that will help us keep putting one foot in front of the other, to keep making progress, when the going gets tough. Once we know our why, we need to focus on the how. What can we do right now to help us reach our goal? It’s good to know that the big goal is there, but now we just focus on the process. To ultimately be successful, we want to just focus on the steps along the path that will help us to reach the bigger goal. Let's say we want to “get healthier.” Friend, there are ALL KINDS of ways we can get healthier. To support our physical and mental health we could eat more nourishing foods, cook more at home, sleep better, move our bodies more frequently, meditate, get outside every day, practice to improve our skills at a favorite sport or hobby, learn a new skill. The list is endless, and can be just as overwhelming as the big picture when you look at all of the possible options. This can make taking the first steps to trying something new or achieving success in some arena of our lives is difficult. So we drill it down even further. To make the process more manageable, we focus on just one task, one small change, that will help us to achieve our goal over time. Say we want to get healthier and we presently don’t eat a whole lot of plants. Our task, our small change, can be to eat a serving of vegetables with each meal. That’s it. That’s what we focus on doing. And we do it to the best of our ability. If we hit a bump in the road or we veer off track, that’s ok.
We’re human. We’re imperfect. That’s what makes us unique.... and AMAZING! We just find the path again and keep moving forward. Pretty soon that one small thing becomes a habit. It’s just part of our daily lives. And we’re miles closer to that big picture goal. Once that first small thing becomes easy, we focus on the next task, the next change. We keep making progress. We keep moving forward. And that's when we WIN! Sometimes you win and sometimes you learn.... but you NEVER lose! ➡️ Keep moving forward always seeking PROGRESS not perfection. Leave me a comment below telling me HOW are you winning this week. I want to celebrate along with you! Are you on track with a goal? Maybe you have been successful with doing a desired behavior? Did something happily unexpected just cross your path?